Senator Susan Collins of Maine said in a statement that “hundreds of thousands of federal employees and their families are being harmed by the partial government shutdown. 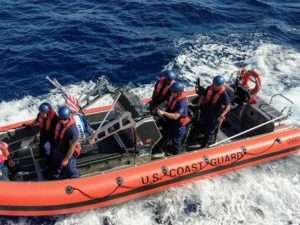 This situation is especially unfair for those who must work without pay, including members of the Coast Guard who continue to perform critical national security and lifesaving duties without knowing when they will receive their next paycheck,” she said. All around the country, groups are holding food drives for Coast Guard members and civilian employees who have been furloughed. Admiral Karl L. Schultz announced that a $15 million donation has been made to the Coast Guard Mutual Assistance program by the United States Automobile Association. Funds will be distributed by the American Red Cross to aid service members who are having financial difficulties during the shutdown. Congress passed a bill Friday called the Government Employee Fair Treatment Act of 2019 which will retroactively pay Coast Guard members and civilian employees, but it will not go into effect until after the shutdown ends. It has been presented to the President. The partial shutdown of the federal government is in its fourth week. As of January 12th, it became the longest partial shutdown in U.S. history, surpassing a 21-day record set in 1995. Work at sea is some of the most dangerous work in the world. Maritime workers and fishermen rely on the U.S. Coast Guard as first responders and safety agents.